The StorSimple 5000 and 7000 series contain a lot of choices that need to be made. For this purpose I can ofcourse provide customers with an elaborate design document in which each design choice is thouroughly weighed, but that document seems to be an overkill in this highly pragmatic world today. Loads of customers just want it “up and running”. One of those many choices that can be made is the choice in Volume Type. 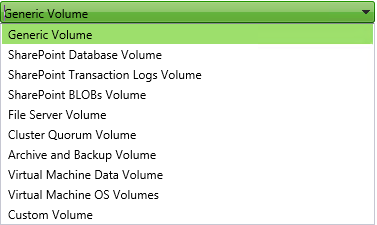 Since StorSimple can solve a lot of headaches IT managers suffer from, the StorSimple team decided to encorporate some Volume Types that suit typical supported workloads. Let me tell you, it can handle a lot of specific workloads. We have a total of seven Volume Types. Select the correct volume type that most closely aligns with the intended use of the volume. For example, a volume intended to store SharePoint BLOB data should use the volume type ‘Sharepoint BLOBs. By doing this the device can achieve better deduplication and compression ratios as well as performance. This enables you to effectively utilize your on premise capacity. If you’re not sure about what kind of data will be stored on the volume, or the data you’re storing does not have a corresponding volume type, it’s advised to use the Custom volume type, select normal, and set the fingerprint size to 64KB. PLEASE NOTE: Generally people are advised to get in touch with the StorSimple technical support team and do the sizing of your data before you get into this. For data sets that don’t benefit from deduplication and compression, such as media, JPEG and PDF files, use the Custom volume type and set the fingerprint size to 512KB. Now you know how to choose the right volume, right? WRONG! I hope this small blog helps you to make the most of your StorSimple endeavour.